Loving Start10 with Windows 10 and I really like the 'Modern Style' option. I have a question and I just can't seem to figure it out having gone back and forth thru' all different options. How do you get Icons to stick on the left side of the start menu below the 'little divider thingy'. I can pin anything I like but everything appears above the divider on the left. It must be able to be done as I can see the icons below the 'divider' in these two pics on the Stardock website. Trying to click and drag from upper to lower does not work. 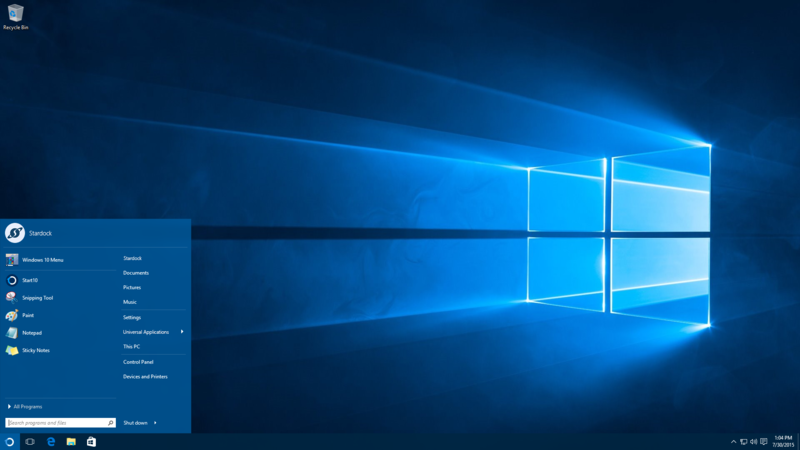 Unpin the Windows 10 Menu. Set the windows key to open the win10 menu. The icons below the line are the recently used applications and it should automatically populate the list based on your app usage. Pinned items are always shown above the line as they are pinned to the top of the menu. This is exactly how things work on Windows 7 too. Is the list appearing blank for you? Yes, Neil the list is appearing blank. I've just gone into the program and ticked 'show recently used programs' and we'll see what happens now. And the bottom half now populates with recently used programs...........thanks. My version shows 1.01 beta. I click update and it tells me there is a new version available. It then takes me to Stardock and offers me 1.01...........I follow the prompts and installation and reboot and it still shows 1.01 beta. We then start all over again and go in the circle all over again! What gives?